The death-haunted last collection of stories from National Book Award winner Denis Johnson. He led a certain life and found ways of giving expression to that life, with varying degrees of imaginative embellishment. After a while, that too – the expressing, the inventing – became parts of the life which were, in turn, folded into the mix, so he wrote about being a writer, though this writer both was and was not the author of the book you’re now reading about … The secret of all this is the shifting wattage, the slipshod magnificence and crazy wonder of the Johnsonian sentence. Clause by clause, word by word, anything becomes plausible. Control is achieved through willing proximity to its loss. It seems he’s ‘just filling a notebook with jazz,’ but then these directionless improvisations acquire the weight of stories. Denis Johnson, in all his work, aimed to locate the hidden, actual face of things. But the new stories build without those miraculous balls of hail, and their truths are necessarily deeper, and more precise, true as you would true a wheel … It feels like the paced vision of a writer who has been made to understand that life is fairly rude and somewhat short, but that the world contains an uneven distribution of grace, and that wisdom lies in recognizing where it—such grace—has presented itself. The stories are about death and immortality, art and its reach, and they ask elemental questions about fiction, not as a literary genre but as a human tendency … These stories ask you to step into the room and listen closely. They are not showy anthems, and in many cases, they have dispensed with hindsight altogether. ...five stories, most of them longer than thirty pages, that span a range of characters and situations, yet are unified by the aspect of Johnson’s work that towers over the rest: his voice. My god, that voice. Johnson somehow manages to be both conversational and poetic, simultaneously heartbreaking and hilarious ... Like any Denis Johnson work, each page of this collection is peppered with one or two tremendous lines that reach out to grab your heart ... Johnson has an astonishing power to turn from one emotion to another in a line or two. His transitions between stories, sections, and paragraphs are worth the study of every aspiring fiction writer ... 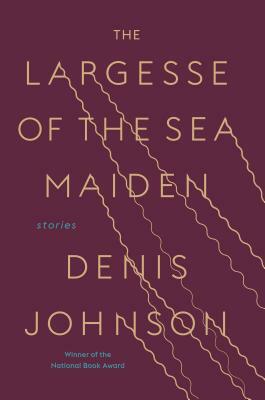 The Largesse of the Sea Maiden is yet another terrific book of heart, humanity, and humor. Read and treasure it. It is a final gift from a master. What did you think of The Largesse of the Sea Maiden: Stories?